Leading Manufacturer of roller type magnetic separator from Ahmedabad. Being a customer focused organization; we are engaged in manufacturing and supplying high-quality Roller Type Magnetic Separator. Manufactured using the high-grade material, our range is used for speed cleaning and for separating weak magnetic minerals. Our range removes the minerals out of a conveyed material and discharges them as distinct and cleans the material. 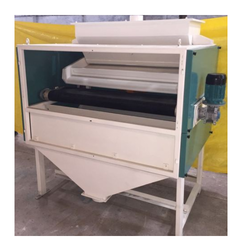 "We are majorly looking foreign enquiries only"
Looking for Roller Type Magnetic Separator ?